A young doe ran by, its white tail up. It did not appear alarmed, just in a hurry. A pleasant breeze caressed my face, coming out of the south, same as the deer. The faint scent of oak leaves and an impending rainstorm filled my nostrils. I squinted to avoid eye contact, confident the hemlock’s upturned boughs concealed my human form. The deer’s ears offered the only sign the animal was testing the forest. When it drew even with the hemlock it slowed to a steady walk. 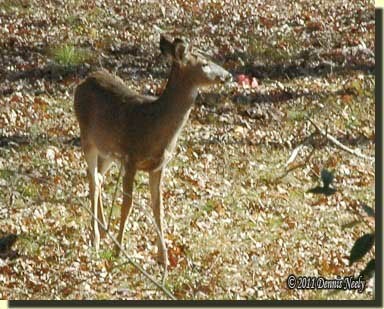 This deer’s shape was fuzzy and gray, distorted by almost closed eyes. As I watched, I thought better of the situation. My thumb found the Northwest gun’s hammer; the smoothbore’s muzzle eased a bit downhill; and when the doe glanced east I pulled my left knee up to provide a steady shot at a trailing buck. Sequestered within the evergreen lair, my mind sifted through the death sphere’s potential paths. The doe curled to the northeast, removing any chance of passing through my deadly fragrance. I lost track of it after the crooked cherry tree, choosing instead to watch the cedar-covered hillside where it first appeared. Hidden amongst the cedar trees was a string of rubs and two scrapes, and that deer seemed to follow the rub path. “A buck cannot be far behind,” I reasoned. Turkeys bantered and squawked across the nasty thicket, on the west face of the ridge. While I listened another antlerless deer walked down the hill and struck the same trail as the first. It sniffed the ground, loped to the crooked cherry, then sauntered in the same direction as the first. Next, a skittish old doe crossed the narrow isthmus that separates the nasty thicket’s two lobes, angled up the hillside and stopped thirty or so paces to my right. Her spring fawns wandered along, an abnormal distance behind. The last fawn, a little doe, stood and stared at the hemlock. Seeing her attentive concern, the old doe turned about and surveyed the hillside. The young one half-sniffed, half-snorted, relaxed her haunches and scampered after the button buck. The three milled about, scrounging for acorns, then disappeared over the rise. As a single turkey uttered a soft “ark, ark, ark, ark…” on the ridge, my fingers fiddled with the brass tacks on the trade gun’s forestock. The domed tacks were not period-correct for that 1794 traditional black powder hunt. They have drawn criticism from astute living historians, and as so often happens, one discovered fault seems to spawn closer examination. “Old Turkey Feathers’” history-based lineage is suspect, and I know that. I fall out of character now and again and pick the gun, or some other accoutrement, apart—I am my own worst critic. But thirty-plus years ago, trade guns were an oddity, appreciated by Charles Hanson, Jr. and promoted by Curly Gostomski, Ray Woodall and a very few others. There is a reason they were called “gas pipes” in the early 1980s. The majority of trade guns in existence at that time sported brass tacks based on museum examples. In that era accepted research and documentation techniques weren’t what they are today. On the one hand, that is a tribute to the advancement of the hobby, but on the other, it is a feared bane for folks like me. Now I have changed with the times and worked diligently to improve my kit using a balance of primary source documentation, surviving artifacts and period illustrations or paintings. But traditional black powder hunting is, after all, a hobby, and as with most hobbies, limited time and resources often dictate how far an individual can take that hobby. In the case of limited time, faced with a choice between spending an hour or two in the woods hunting or staying home and working on a new trade gun, the hunting trip will always win. Although well-worn, I own a Northwest gun that has served me well and is an accurate and productive arm. Regarding limited resources, right now I just can’t afford the parts to build a new gun. For less money I can clothe a whole new woodland persona, which interests me more at this point. I find fleshing out this new character fun and exciting, a close second to the exhilaration and enjoyment I get from hunting. The adrenalin rush is similar to that when I first started my journey back to the 1790s, and I am discovering that those feelings are recharging my enthusiasm. A few sentences later, Joe got to the root of his fears: he has witnessed the brutal criticisms other living historians have weathered in recent days, especially on the online forums. In the last year, the caustic comments have spilled over to many living history venues. I see the criticisms forcing dedicated living historians to question their every choice, and in few instances, this close scrutiny is driving folks from the hobby. As a society, we seem to be losing all sense of civil decency in our daily discourse. 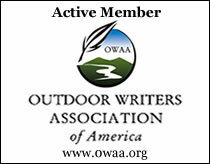 Because I write about living history, specifically traditional hunting, I share Joe’s fears, but about ten times worse. None of us want to be judged and found wanting, especially when our leisure activities are the brunt of the scrutiny. I find myself expending conscious effort to reign in the fear of “not getting it right,” because if I don’t, the trepidation cripples the mental attitude so necessary for an enjoyable time-traveling experience. Fortunately, traditional black powder hunting, by its very nature, is a solitary endeavor—a one-on-one encounter with the wild and its creatures, framed in the past. As I told Joe, this hobby is supposed to be about having fun, putting wild game on the table and advancing the participant’s knowledge and understanding of his or her chosen time period—not an ongoing source of angst and gut-wrenching fear. As fellow traditional hunters, we must recognize that each participant is at a different point on his or her journey back in time; some folks will always be ahead of you, and some behind, and that fact will never change. What does change is our knowledge and understanding of our own historical persona, and each unearthed nugget should advance that understanding, not set it back. And even then, traditional hunters must realize that any hunting scenario based on a bygone era, can only approach the circumstances of that era, but never achieve a 100-percent duplication. Take any criticism with a bucket of salt, be safe and may God bless you. 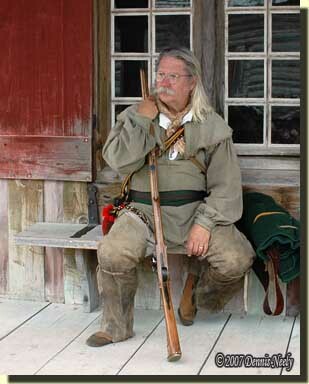 This entry was posted in Deer Hunts, Living History, Persona and tagged Dennis Neely, historical trekking, North West trade gun, Northwest trade gun, traditional black powder, traditional black powder hunting, traditional blackpowder, traditional blackpowder hunting. Bookmark the permalink. Thank You, Dennis for another thoughtful and thought provoking article. I have often experienced that the harshest critics or the loudest ones, are the ones with the least knowledge or understanding or lack selfrespect and confidence. Self-examination is an integral part of this hobby; it leads us all to a truer understanding and representation of life in our chosen time period. I’ve also found that most of the “experts” are hiding behind their keyboard’s,not a lot of them “in the field” getting dirty! At least none have said anything to me. I don’t feel my “kit” is 100% correct for an 1812 Market hunter who is in the twilight of his career,yet not 1 person has ever said anything to me about my stuff.Maybe it’s because most of it is 30 years old and used HARD,and,A LOT!